Team Yue Fei has its first casualty. Poor guy was just too embarrassed to take off his pants in front of everyone. Aw, Zhang Yong blames himself for the faulty map. Yue Fei announces Plan B, which is to wait (for what?!) They run out of water and food. Yue Fei wakes everyone up and dramatically eats an earthworm (EWW). Manliest chewing ever. It’s even more nasty, because they still have a dead body in the middle of the pow wow circle (and next to his earthworm digging spot). Team Yue Fei finally captures some bandits and uses them to lead half the bandits out of camp. Most of the bandits fall into traps set by Team Yue Fei. 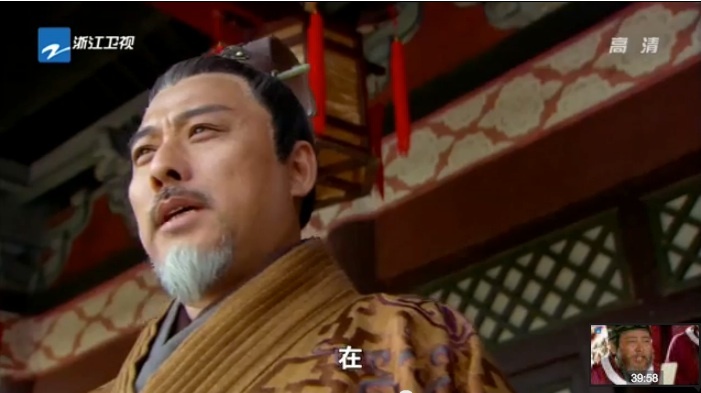 Yue Fei tells them that they’ll decide the outcome of the battle in a two v. one duel (why is this always the case…). Yue Fei and co. corner Tuo Ba Ye Wu on the edge of a cliff. 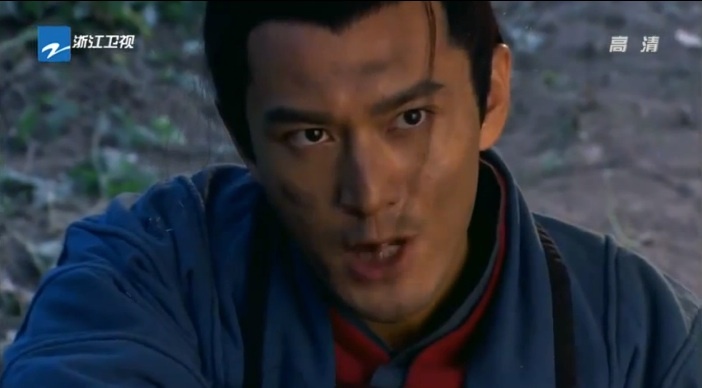 Yue Fei tells him to jump off the cliff. 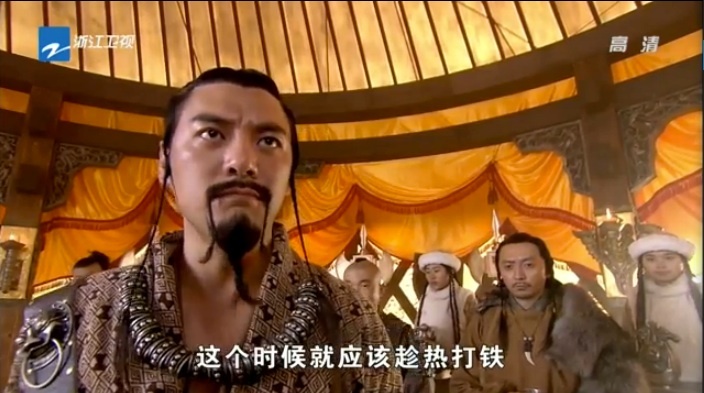 Usually, he doesn’t kill, but he wants to avenge General Liu Ge. One of Tuo Ba’s followers jumps off the cliff in place of Tuo Ba. After a lot of talking, Yue Fei decides to let Tuo Ba go back. 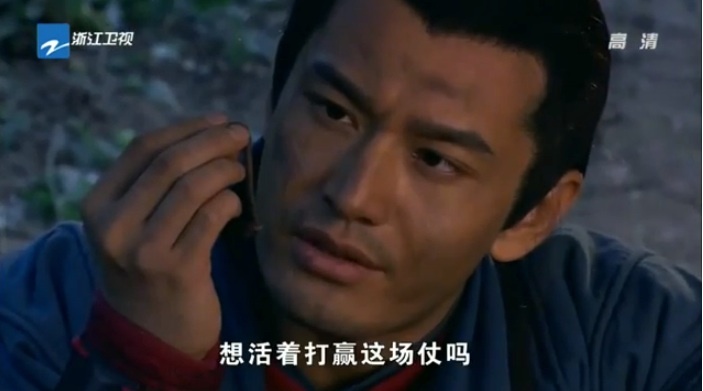 While everyone tries to warn Yue Fei against it, Tuo Ba cuts off his own ear. The soldiers leave. Yue Fei reports his victory to General Zong, who celebrates Yue Fei’s bravery without noticing his followers’ dirty looks. 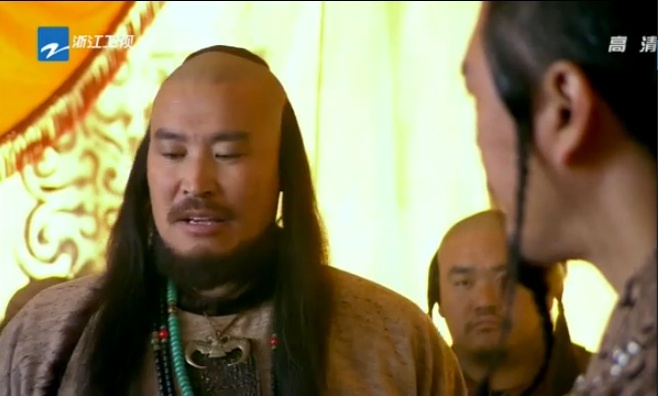 General Zong lets Yue Fei keep his 100 followers. 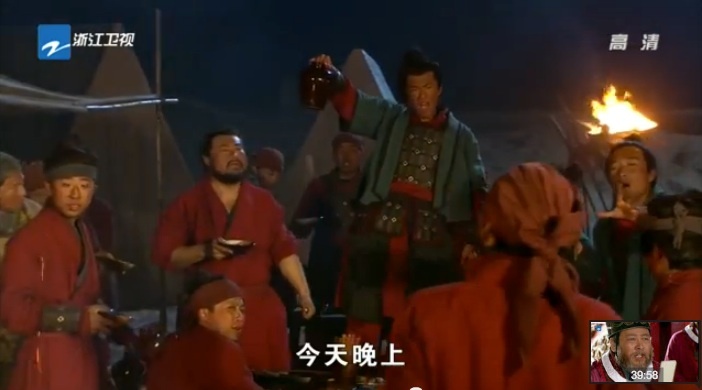 At night, Team Yue Fei has a manly drinking party. 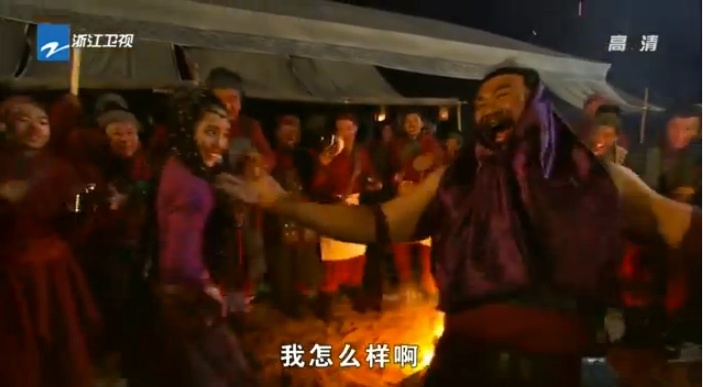 Wu Shi Ma dances in the center of the sausage-fest. 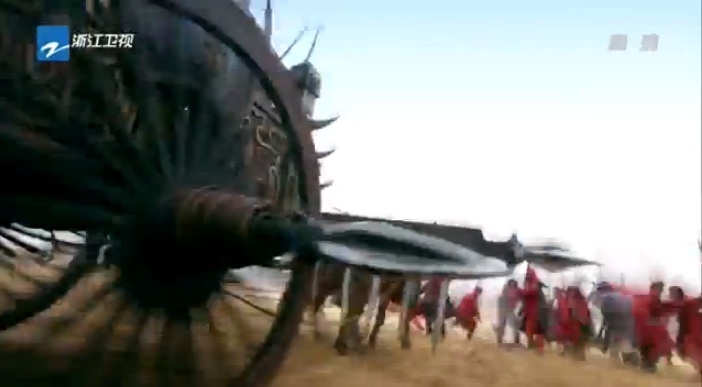 In the Jin camp, Wu Zhu wheels in a menacing machine, and they name it Tie Fu Tu. The machine is put to the test, and proves to be deadly against some Song prisoners. (It looks pretty juvenile to me…but meh). Team Jin lays out their battle plans. Tuo Ba wants to use the leftover forces from Wu Gong mountains. Wu Zhu calls Tuo Ba out for requesting large amounts of silver, even though the Wu Gong bandits are currently locked up. 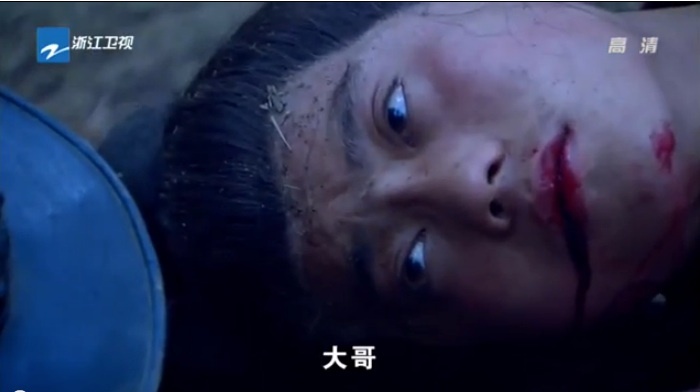 Wu Zhu also exposes the Tuo Ba’s missing ear and defeat at the hands of Yue Fei. The 2nd Jin Prince names Qin Hui as a possible ally. Why, Yue Fei. Why. Why would you let him go. I think you’re gonna regret this so much later. I can’t even right now. This is war! Why you gotta be all compassionate. I like the actor for Wu Zhu so far. He manages to convey Wu Zhu’s dangerous intelligence, not just brute force. The Jin princes are quite a menace. The 1st Jin Prince is a powerful general. The 2nd Jin Prince seems very spiritual and doesn’t want blood shed, but he’s arguably more dangerous with his scheming. Wu Zhu is a shrewd combination of both, which makes him a force to be reckoned with. This entry was posted in Chinese Dramas, Drama Recaps/Reviews, History and tagged 精忠岳飞, Episode 10, Huang Xiao Ming, Jing Zhong Yue Fei, Patriot Yue Fei, Recap. Bookmark the permalink.